“The project idea came from this tongue-in-cheek Twitter post. But hey, why not try to make one? I read somewhere that the world needs more ridiculous smart devices”. These are the words of Eric Tsai, a maker of connected devices and home automation, on his website etsai.net. And while this website boasts many interesting and useful projects (plus a watermelon sea monster), it was his tongue-in-cheek ‘Too Much IoT’ project on hackster.io that had us chuckling. The aforementioned Twitter post? 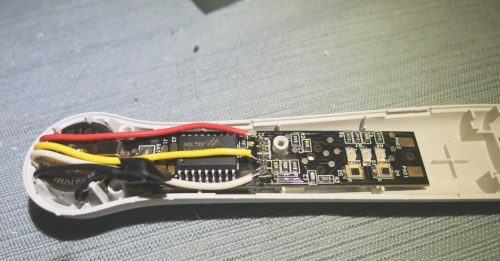 IoT pregnancy test: connects to phone via BLE, instantly tweets test results. Also text msg result to contacts name “mom”. 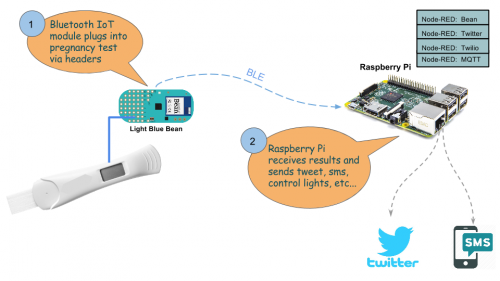 Eric did indeed create an IoT pregnancy test: it’s a Bluetooth-enabled digital pregnancy test that sends data to a Raspberry Pi which, in turn, sends a tweet of the result (as well as a special text message to your Mum). Does your test have an ON button? What kind of battery does it use? Do the different characters on the LCD overlap, or are they separated? Well, I mean, is “Pregnant” the same as “Not Pregnant”, but just without the “Not”? You need a serial number? No, I don’t have a serial number, I haven’t purchased it yet. Oh, well… I like to be prepared. And after that, a search of YouTube provided the information he needed in order to hack the test. After working his way through the internals of the test, the LCD pins, and the energy consumption, Eric was able to hijack the correct components and solder new wiring to gain control of the ‘not’ and ‘pregnant’ portions of the display, along with the clock function and, obviously, the ground. The Light Blue Bean provides the real world I/O and Bluetooth connectivity. The digital I/O monitors the “Not” and “Pregnant” pins on the LCD and compares them to the “clock”. When they don’t match, it means the corresponding icon is being displayed. The Raspberry Pi runs Node-RED to receive data from the Bean. Using Twilio, the Pi can tweet, text, or email the information to any predetermined recipient, advising them of the test results. As a home automation pro, Eric already had several lights in his house set up via MQTT and OpenHAB, so it wasn’t hard for him to incorporate them into the project, triggering them to light up to indicate a positive result. Though the project was originally started as a joke, it’s clear to see that Eric enjoyed the process and learnt from the experience. And if that wasn’t enough, he also used the hackster.io project page as a means of announcing the news of his own impending bundle of joy. So congratulations to Eric and his family, and thank you for this brilliant project! I like the fact that it tweets as tweet contains the word wee, seems rather fitting. It’s so rare that we see something… positive… on Twitter. Not entirely sure why you would want to automatically tweet the result of a pregnancy test, but OK! If you read the post, that’s kind of the point! They might need be to be fairly careful about timing. 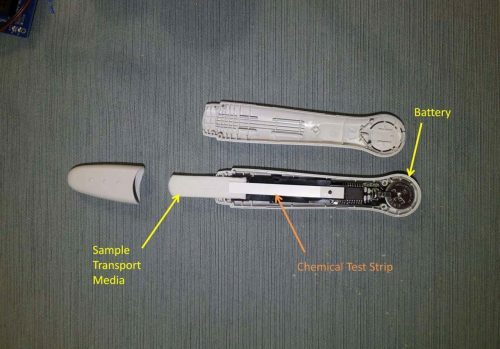 A lot of the stick tests turn positive after a while anyway. It’s why the instructions say to check it after a certain amount of time. You hear of people discovering ‘positive’ pregnancy tests in the bin and freaking out when it’s just the chemistry continuing to react. Raises all sorts of questions…Just how many times would someone want to use the kit? Would you pass it on to a friend when you’re not using it? What if the wrong Twitter handle was used? Regardless though, as pointed out in the article, what started out as a bit of a joke wad a great exercise in learning and making. Well done Eric. LOL. This was funny, thanks for writing it up. The unwitting project assistant was born this summer. Her name is Hazel, and she’s great. Congratulations. Hazel is such a beautiful name. We loved the project so thank YOU, Eric.